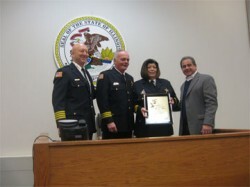 The first inaugural Berwyn Police Department Awards Ceremony was held on Sunday, Dec. 4, 2011 in the community room of the police department. Mayor Robert Lovero and Police Chief Jim Ritz hosted the event which honored and recognized the employees of the Berwyn Police Department. There was a huge turnout of police officers, civilian and volunteer staff and their families who were all present for the first time ceremony. Department Awards were given out for; Community Service, Meritorious Service, Department Commendations, Municipal Alerts, Good Conduct Awards, Years of Service, Traffic Citations which included DUI, Seat Belt, and Speeding enforcement, Military Service, Officers of the Year, and the DCC Award for Loyalty-Camaraderie-Honor, in honor of Division Commander Leilani Cappetta who retired after 27 years of service with the department. The event was made possible through the efforts of the departments Awards Committee and the Illinois Municipal Police Association (IMPA) who donated all of the ribbons and awards. The Awards Committee was established by the department, and through their dedicated efforts they established the protocols, guidelines, and the criteria to receive awards based on acts of bravery, heroism, outstanding accomplishments, and for exceptional performance by individuals or department units.